If you would like to jump straight to our list of favorite beds, click here. 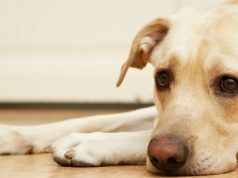 Otherwise, read on if you would like some advice on getting your dog to quit destroying its bed. There are a few reasons dogs destroy their beds. Dogs are natural chewers, diggers, and shredders. Look at your precious pup’s toy basket. Most dog toys are soft, fabric covered, fiber-filled, objects designed to look, sound, in some cases even taste like wild game. Toys trigger the canine instincts to chew, they serve to soothe and entertain. Many dogs tend to “kill” the game and delight in ripping the toy to pieces. Now, look at the dog bed. Is it a soft, fabric covered, fiber-filled object? The dog thinks, “Cool — new toy — must kill!” It is not really a “bad dog” misdeed, he simply exhibiting a natural response. If the killing game isn’t the motive for the bed destruction, dogs are also prone to “nest.” In the wild, they scratch the surface of the chosen slumber spot and soften the ground before settling into a curl to sleep. Even the most comfortable dog beds beg to be fluffed a bit. Stronger, digging-inclined dogs can easily rip the cover of the dog bed and oops…another one bites the dust. Then, there are the dogs who are anxious, phobic, bored, or in pain. A dog suffering separation anxiety or a fear of storms will often tear into anything in sight. 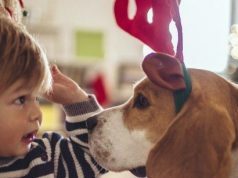 Dogs without adequate physical or mental stimulation will exhibit destructive behaviors including inappropriate chewing, digging, and shredding. 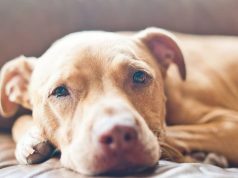 A dog with an ear infection, a puppy teething, or the senior dog with arthritis or muscle aches may react to discomfort by tearing their bed apart. In some cases, behavioral modification training may help control the damage. No Free Lunches – Simple Tips for Good Behavior, provides a few recommendations for effective training. It is also a good idea to have a thorough physical evaluation by a veterinarian for your bed-terminator to ensure no underlying health problems are contributing to the issue. Pet bed manufacturers assure buyers of the relative benefits of purchasing their products – and there are hundreds of dog beds ranging in price, advertised in the marketplace. 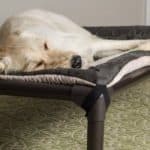 To provide a fair determination of the “Best of the Best Indestructible Dog Beds,” we combed through dozens of manufacturer’s sites examining product claims. Then we checked consumer product reviews. Listed on most retailer’s online sites are filters. By entering “Indestructible Dog Beds” in the search engine, all dog beds identified by that criteria appear. 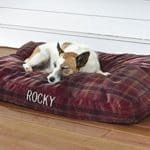 For example, a retailer like Amazon.com returned 140 entries for “Indestructible Dog Beds.” A deeper search reveals consumer reviews of each product. We used the product description, sales, and most important customer reviews to determine the top products. Consumer review – The strongest variable used for ranking indestructible dog beds for this blog, is the consumer review. A solicited survey of buyers provides notes about their likes – and dislikes of a product based on a defined scale; five stars = excellent and opinions progress down to one star = poor. Customers are also encouraged to provide comments about their buying experience. The opinions are then published for public viewing. Variety – Second, we looked at the selection of options within the brand. Types of beds vary by use for example; indestructible dog beds for crates, water-resistant indestructible dog beds for indoor/outdoor use, and indestructible dog beds with removable/washable covers, fabric color options, and sizes available within the brand. Dog beds are not, after all, a one-size-fits-all proposition. Price – Third, we considered the price of the indestructible dog beds for comparison. Is the bed a good value proposition? Is the consumer realistically getting what they paid for? Guarantee – The last variable for our ranking consideration is the manufacturer’s guarantee. What sort of warranty is offered with the purchase of the indestructible dog bed? Three “indestructible beds” climbed to the top of the “Best of the Best” list. Consumer Rank – 4 Stars “Orvis lived up to their promise!” The Orvis ToughChew Dog Bed consistently ranks 4-stars or higher on consumer lists. The company is highly regarded for customer service, and that alone may keep their products elevated, it is after all good to buy with confidence. Brand Variety –The Orvis ToughChew Bed is available in sizes to fit dogs from the tiny Pomeranian to the giant Great Dane. Orvis ToughChew Beds are designed for different sleeping habits including; bolster beds, comfort fill platform pillow beds, and memory foam beds. A wide selection of covers fits nearly any décor, and the replaceable fabric is not only durable but machine washable. Orvis even offers a custom monogramming service for the “name conscious” pup. wide range of choice options. Orvis provides superior customer service. Fiber-filled pillow construction may actually encourage tearing. The sleek, Kuranda Chew-Proof, All Aluminum, Ultra Duty Platform Bedis designed to foil even the most determined dog-gone chewer. The patented design secures fabric inside special channels in the frame making it inaccessible to dogs. Consumer Rank – 4.5-Stars “Best beds ever!” Eighty-eight percent of consumers reviewing this product ranked it with 5-stars. The few complaints recorded involved difficulty with assembly. Brand Variety – Kuranda Chew Proof Dog Beds are available in multiple sizes to fit toy dogs, to giant breeds. The sturdy, chew-proof fabric cover comes in four color selections. Easy to clean (just hose it off) and weather durable the Kuranda bed is versatile and easy to transport. Not all dogs will adapt to the raised platform bed design. Paws down the Big Barker Orthopedic Dog Bed has the leg up on the competition for overall customer satisfaction. Specifically designed for comfort, toughness, and endurance the company does not advertise their product as “indestructible.” The omission doesn’t stop some 300,000 consumers from praising the quality and durability of Big Barker beds. 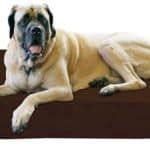 Variety – Engineered to support the bulk of big dogs (over 50-pounds) Big Barker’s beds are available in three sizes (large, extra-large, and giant), a variety colors, and sleep models. For dogs weighing less than 50-pounds, the company makes a line of Barker Junior beds. The mattress is a proprietary three-stage foam construction capable of supporting up to 300-pounds. Big Barker also manufacturers crate pads, SUV cargo inserts, waterproof liners, and replacement covers. The tough, easy to clean, machine washable cover features a hidden zipper. Big Barker beds are designed to look like a piece of high-end furniture. Guarantee – Big Barker offers a “can’t flatten, won’t flatten,” 10-year, replacement warranty on their beds. The company also provides a 1-year trial offer with a 100% refund (they even pay the return shipping)! 10-year warranty limited to quality of mattress. 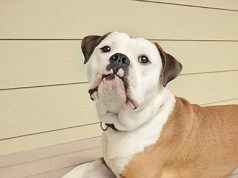 The cost of an “indestructible” dog bed can range from less than a hundred dollars to more than a thousand dollars. Do your homework before purchasing. Consumer reviews are excellent tools when determining quality standards and most important – a company’s reputation for good customer service. Read product descriptions, review return policies, and understand manufacturer warranties. In the end, choose a bed that provides your precious pet with comfort, one that supports health for a lifetime – or nearly that. 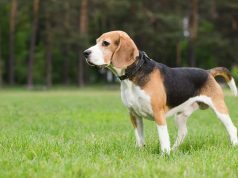 After all, it is the satisfaction of the family member with four legs and a tail that matters in any final evaluation. Next articleTeacup Cats…Cute or Crazy?